Home > Accessories > Brackets & Housings > Heated Weatherproof Outdoor Camera Enclosure w/automatic 24 VAC Heater and Blower - With BRACKET! 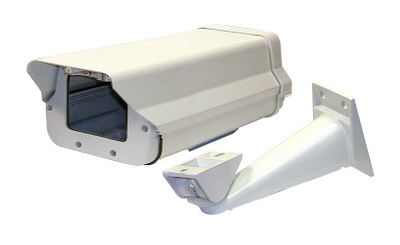 This outdoor camera enclosure is popular for box-style C or CS-mount CCTV cameras that need to be mounted externally. This ENC-1 outdoor camera enclosure is ideal for these types of cameras, and has a built-in heater and blower to keep the camera cooler during the summer and the glass heated in the winter to help keep condensation and ice off of the glass. The ENC-1 outdoor enclosure has a strong wall mount bracket, and durable glass front cover for crystal clear view. Simply mount your C/CS mount camera into the enclosure, and run 24VAC power to the enclosure (optional power adapter found above). This enclosure will attractively protect and enclose your camera in style.